The magnitude of the equilibrium constant gives an idea of the relative amount of the reactants and the products. a) larger value of the equilibrium constant ( > 103 ) shows that forward reaction is favoured i.e. concentration of products is much larger than that of the reactants at equilibrium. This shows that at equilibrium , concentration of the products is very high , i.e. reaction go almost to completion. b) Intermediate value of K ( 10-3 to 103 ) show that the concentration of the reactants and products are comparable. c) low value of K ( < 10 -3) shows that backward reaction is favoured i.e. concentration of reactants is much larger than that of products i.e. the reaction proceeds to a very small extent in the forward direction. At any stage of the reaction, other than the stage of chemical equilibrium, concentration ratio, as given by the expression for the law of chemical equilibrium , is called concentration quotient or reaction quotient. 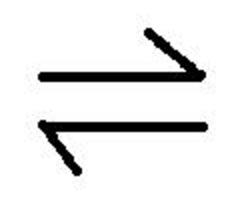 2) If Q > Kc , Q will tend to decrease so as to become equal to K. As a result, the reaction will proceed in the backward direction. 3) If Q < Kc, Q will tend to increase so as to become equal to K. As a result, the reaction will proceed in the forward direction. 1) Write the balanced equation for the reaction. 2) Assume x as the amount of the reactants reacted or a product formed. 3) Calculate the equilibrium concentration of each reactant and product from its stoichiometry of the equation. 4) Write expression for Kc or Kp. 5)Substitute equilibrium concentration and calculate x.